Early part of this week I got an e-mail inviting me to be a Staff Member at the Scrapbook News and Review magazine!!! Yepppp....that's right....I couldn't believe my eyes!!!!!! And even though I didn't really know what that entails, I decided to accept the offer and am I ever glad I did! I immediately fell in love with the owners and the other Staff Members! I am totally honored to be part of their magazine. If you are not familiar with Scrapbook News and Review magazine, I suggest you check it out. It's full of inspiration and yes, there are lots of reviews of all kinds of different manufacturing products, so you can see products being used before you buy. So, I hope to bring you lots of inspiration and hope you join us in the forum for a chat and hope you will submit your special work to their magazine so they can publish it. I will post from time to time the calls here on my blog, so you know. Pretty cool, isn't it? 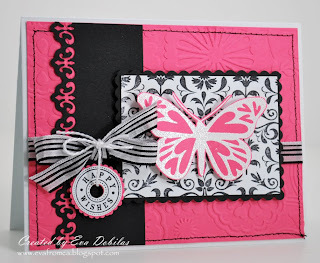 This card is also for this week's Caardvarks color challenge, which was black, white and hot pink and also for the Hero Arts blog challenge make a card for a friend and mail it, so this will be mailed to someone who needs happy wishes right about now. 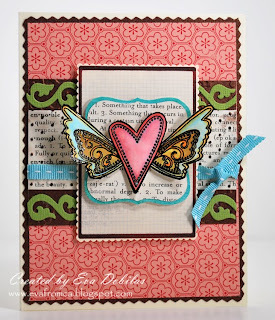 Cardstock: Stampin Up and The Paper Co.
And my card which used the color challenge on Splitcoaststampers, which was Vanilla, Close to Cocoa and Taken by Teal, which matched up pretty nice with the new SEI papers. Here is my card, which uses the August Urban Anthology's kit's papers, which is now sold out. 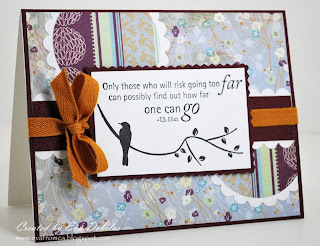 I really love the way this turned out, specially the coloring of the image....click on it to enlarge the card! And my card, which uses papers from the June Urban Anthology kit. This card is so special to me, well, really the stamp. I have been waiting so patiently for my August KOTM from Unity Stamps as this stamp so resonates with me! Just love that quote, so you will be seeing me using this a LOT!!!! So get ready! And my last item to share with you today is the cutest little purse. Yeppp...I just love little purses! 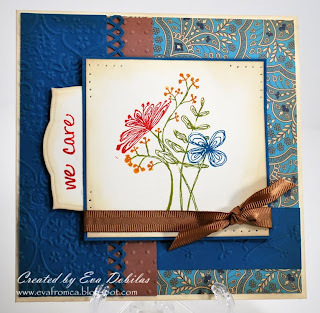 And the die cut is again from Creative Cuts and More, which I just adore, but why don't you take a look and tell me what you think. Isn't this the cutest???? And they are the easiest dies to work with! 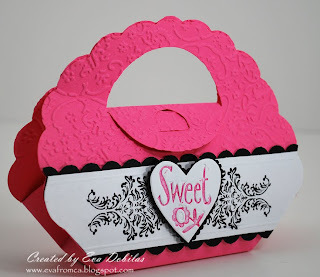 You can put some goodies, a little gift or money in this purse and give it as a gift. It's just adorable and I love it! By the way this is fitting the Caardvarks color challenge again. Well that is all I have for today. I haven't had a chance to make a card with the Saturday's sketch, hope to make it tomorrow. Hope you enjoyed the showcase of cards. Wishing you a happy rest of the Saturday.